September | 2010 | What Year Is It? This Artist May Still Be Alive! These are paintings I’m putting in the Ipswich Art Show, which opens at the Ipswich Town Hall this weekend. Normally, I don’t participate in local events and try to keep a low profile, a secret identity if you will. My point of view has always been – I have a kid in this town, and I don’t want him to be shunned for MY oddity. But, as he recently demanded Mrs. Breen divorce me since I tried to enforce his bed-time, screw it, I’m coming out as a personal punishment to him. I AM EDDIE BREEN! LOOK UPON MY WORK IPSWICH! YES, I’M THAT GUY! BREEN JUNIOR’S DAD! I’m contributing two pieces to the show. The first is new, the second I did a while back, but never put up for sale. This first one is classic breen-dark, the second breen-light. This painting was safe for a while, since, after first painting the frame gold, I thought it then looked too fancy to breen! But recently I hatched this idea, and, well, no painting is safe in my house. This isn’t the first sea monkey captain I’ve done, but it is the first sea monkey CYMBAL monkey. 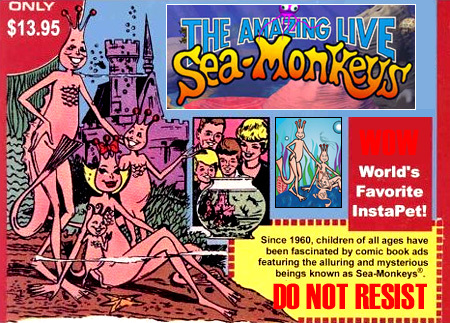 The text says, ‘Do Not Resist’ which, oddly enough, was on the old comic book ads for sea monkeys! Do not resist our completely false advertisement! Buy the shrimp and try vainly to imagine them as tiny hominids! I pasted an off-center monkey face on the captain (note the pipe coming out of the side of his head), with the familiar cymbal monkey grimace. The effect here is that your eye darts around, off-balance, and you feel increasingly agitated, the way you would if the cymbal monkey was actually, annoyingly, slamming the cymbals together! Monkeys hook arms around the outside of the painting as they do in the barrel full of monkeys game, and a numerical code describes the meaning of the painting’s elements on the very inside of the frame. The pipe bubble gives the solution to this EXTREMELY simple code. Various Ipswich insects grace the painting including the greenhead fly, the mosquito and the deer tick(arachnid). A horse is a horse of course of course, unless of course it’s breened, in which case it’s a sea captain! This is one of those rare completely inoffensive breens. Unless you don’t like horses messed with. This is a rare opportunity for locals to see a couple of real breens before they get snapped up by wealthy collectors! I’ll be lurking around the opening, avoiding eye contact with my howling or flustered neighbors, pretending not to be me! Opening Friday 10/1 at 6-10pm / The show will be up Fri from 11am to Sunday,10/3 at 4pm. Jesus lounges in a mouth/doorway, and says “It appears we are at an impasse.” Abe and George have sacred texts dangerously close to the flames. They have mixed symbols, and are both demonized, both sainted. This is an old fashioned, cartoony, chaotic, political breen. This is a truly hideous Breen. Sometimes you start out with an idea and it gets weirder and weirder and the painting draws your eye to its doom, like an eclipse you’re not SUPPOSED to look at. So here you go. Breast-fed special effects and quick paced edited movie shots, todays visual consumer needs some razzamatazz to his art, a spicy helping of menace, EXTREME art if you will. That’s why I placed a solar eclipse in this painting. BUT BEWARE! If you look at this work for more than 20 seconds straight, YOU WILL GO BLIND! Now, you can make a 6’ long cardboard box pinhole viewer, directions here: http://www.exploratorium.edu/eclipse/how.html and view the painting without fear and damage to your retinas. Or, you can just trust me that this is a really, really good painting, buy it whatever the cost, never look at it except with quick sideway glances, and know that you have a truly great, very dangerous work of art on your wall! Imagine the panic and thrills at your next dinner party, when your guests mill around the living room, your boss begins to gaze on your new breen and you scream at him -”Don’t look at that painting! It’ll BLIND YOU! I’m SERIOUS!” Now that’s EXTREME! Text says, ‘Lend Escalier your ear(s) and he’ll sing you a song!’ Also ‘Don’t stare at the eclipse on this painting or you’ll go blind!’ I wrote ‘blind’ originally then kind of half painted over it and wrote it in braille dots. The original painting was a copy of Van Gogh piece, ‘Portrait of Patience Escalier.’ Anytime I see impressionist or post-impressionist portraits I imagine the subjects as lizard people, so I gave him that face. He is gleefully showing off his look with a flashlight under the chin, trying to scare us. VG’s ears keep growing back, so I threw four on Escalier’s shoulders to keep him warm. Starting at only a penny!